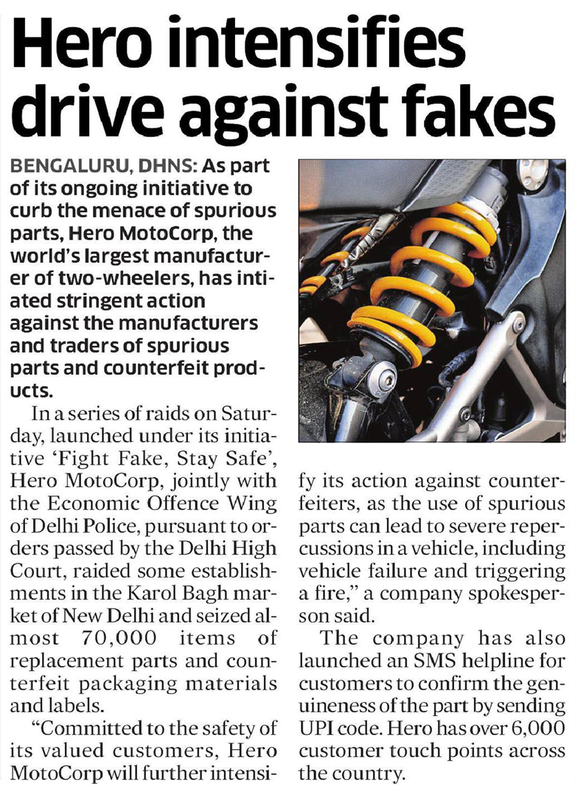 Hero MotoCorp launched the initiative – 'Fight Fake, Stay Safe' to safeguard the interest of its valued customers. 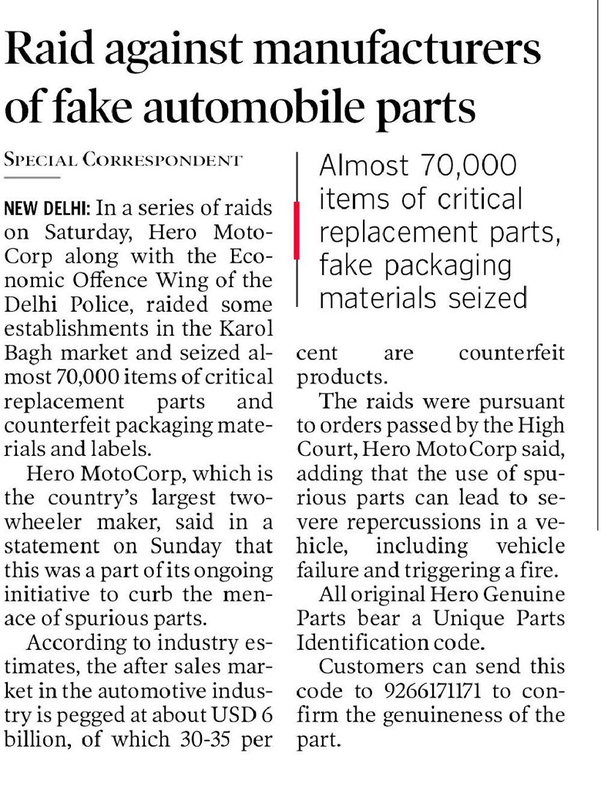 Under this initiative, the company has so far conducted 216 raids in India, on manufacturers and traders involved in the business of spurious parts & packaging. 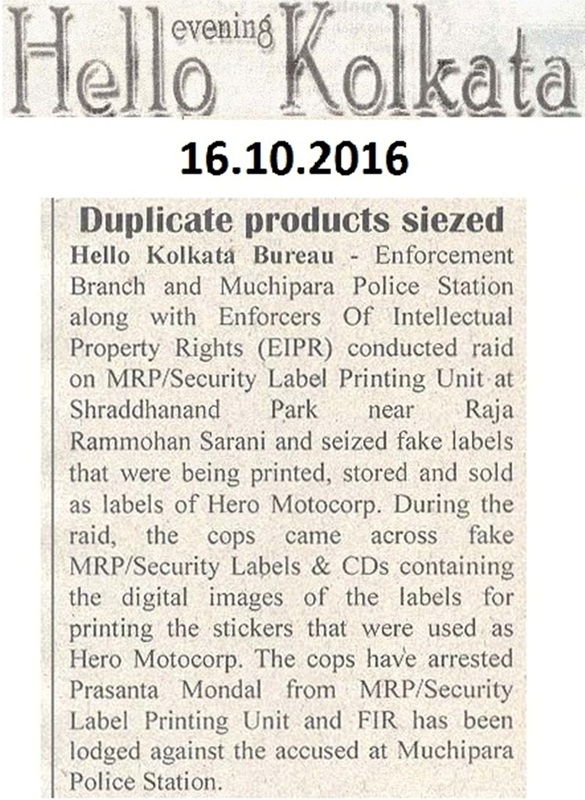 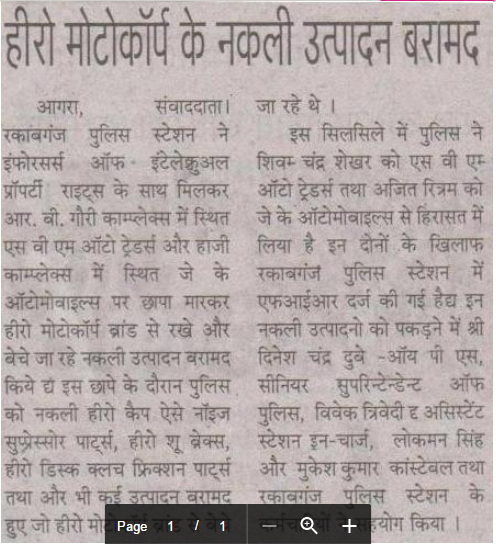 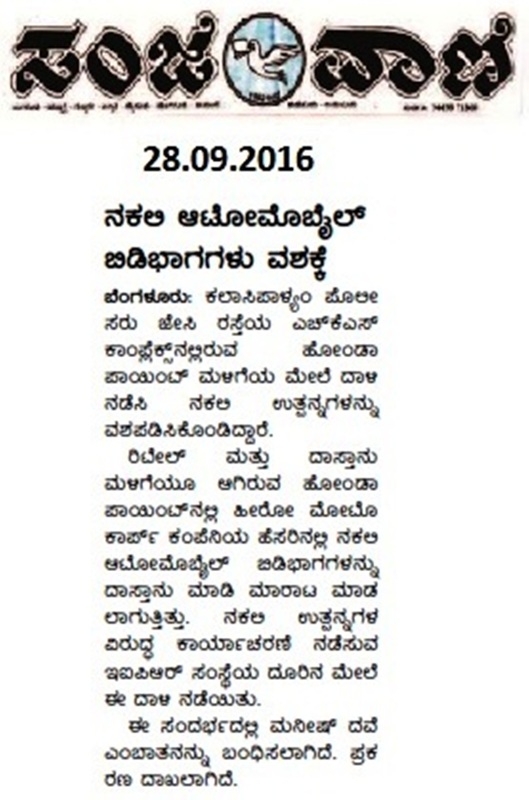 The action against counterfeiters was conducted with the help of Police/ EOW (Economic Offence Wing) & investigation agencies. 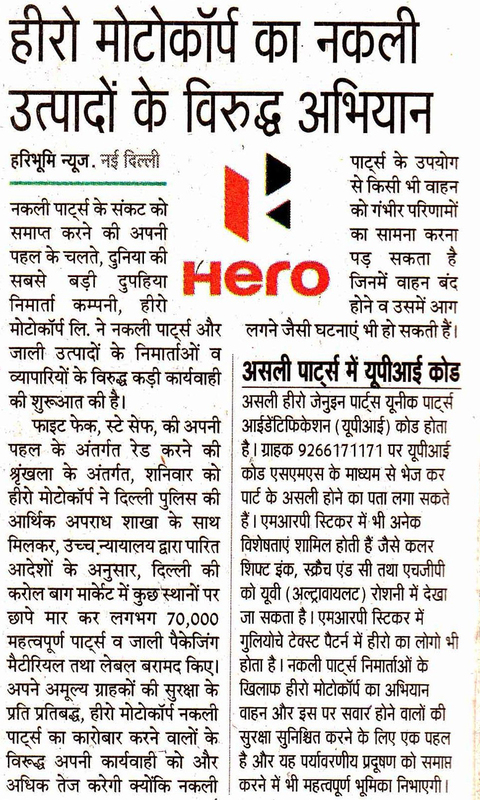 This action started with New Delhi and has covered various affected cities viz. 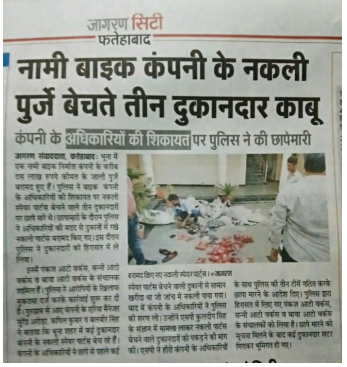 Agra, Ahmedabad, Ahmednagar, Allahabad, Aurangabad, Balrampur, Bangalore, Bhopal, Chennai, Churu, Coimbatore, Erode, Faridabad, Fatehabad, Ghaziabad, Hisar, Jind, Kaithal, Kanchipuram, Kanpur, Kashipur, Kaveripattinam, Kolkata, Ludhiana, Madurai, Meerut, Moga, Muzzaffarpur, Nasik, New Delhi, Patna, Pune, Raisen, Salem, Sangli, Tirupattur, Tuticorin, Varanasi and Viluppuram. 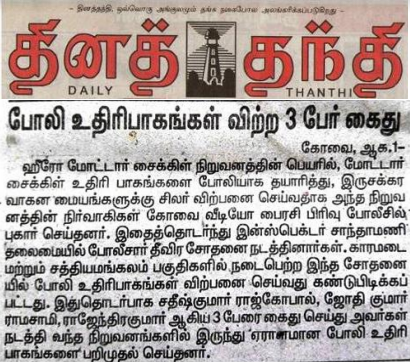 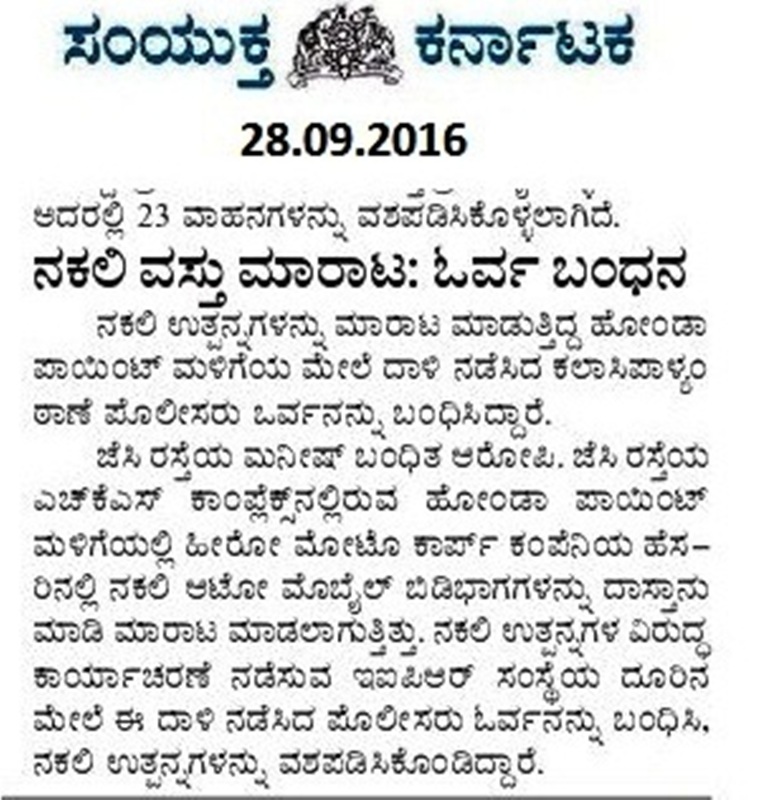 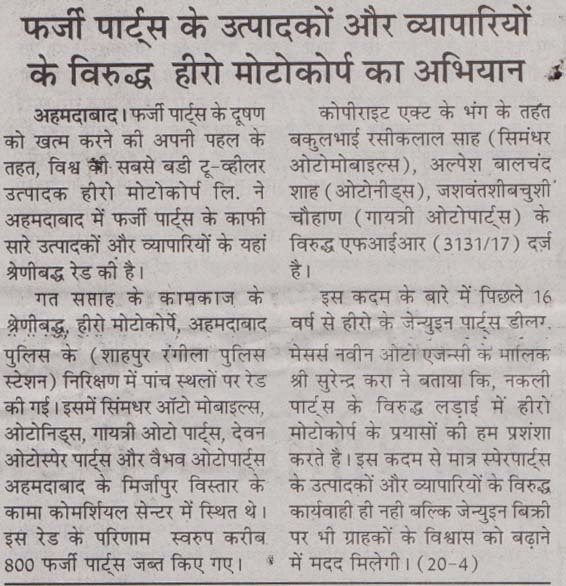 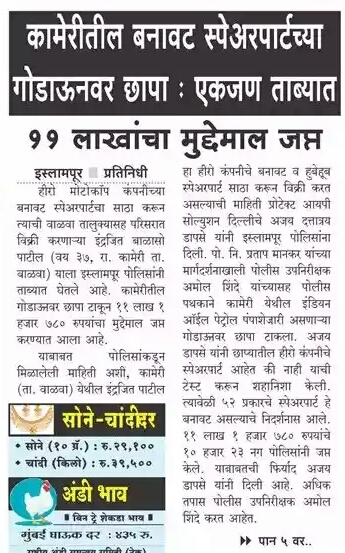 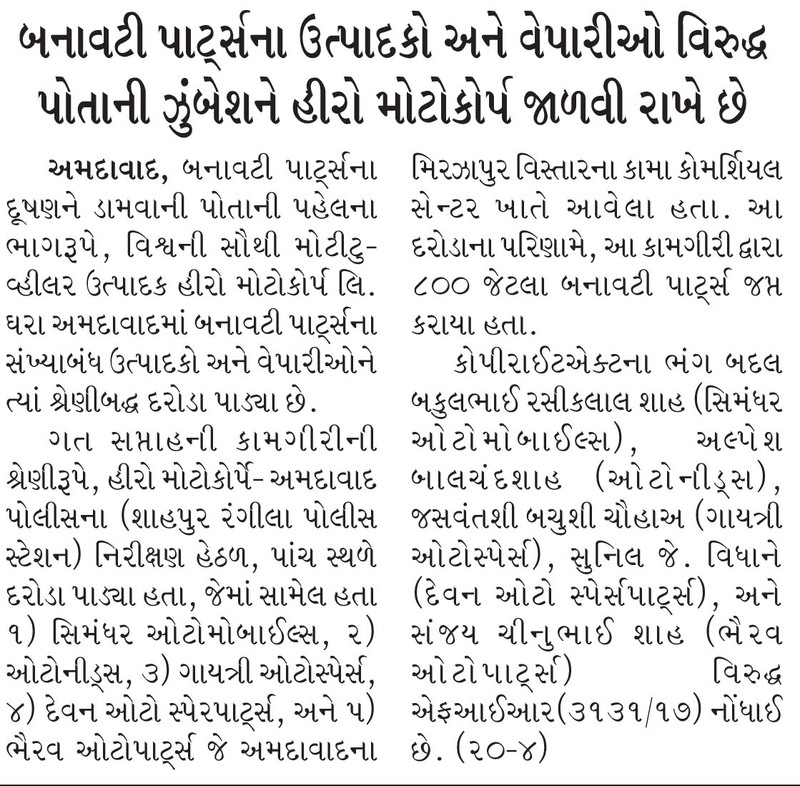 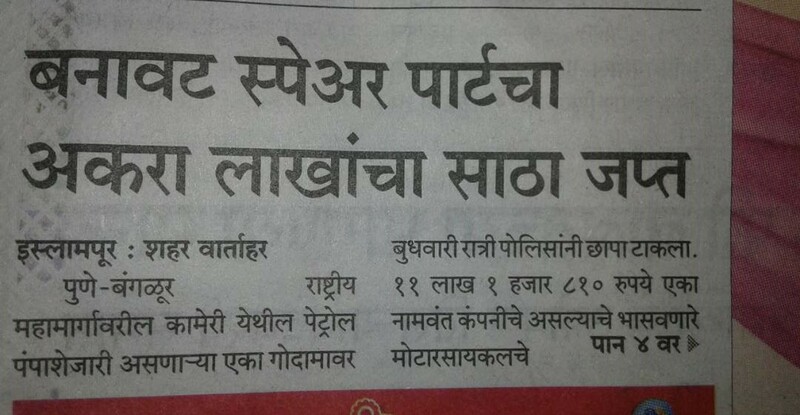 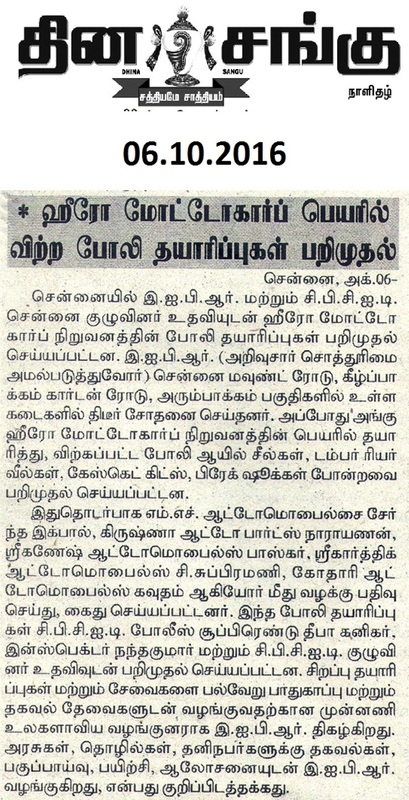 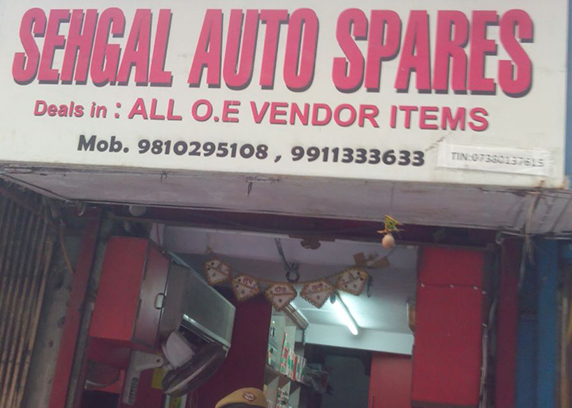 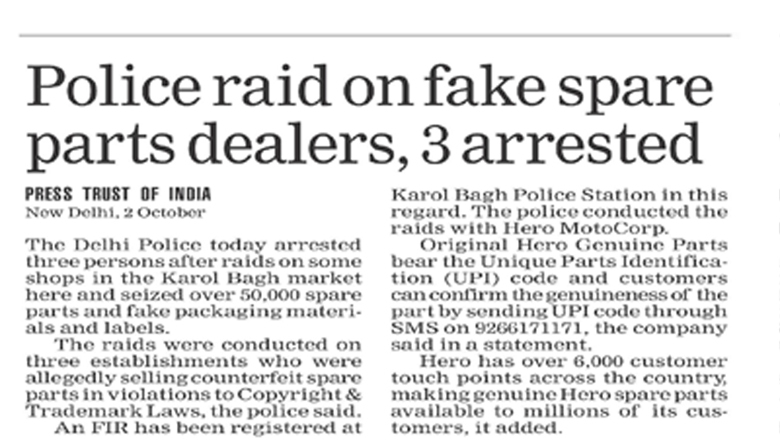 More than 53 Lacs spurious spare parts & counterfeit labels have been seized. 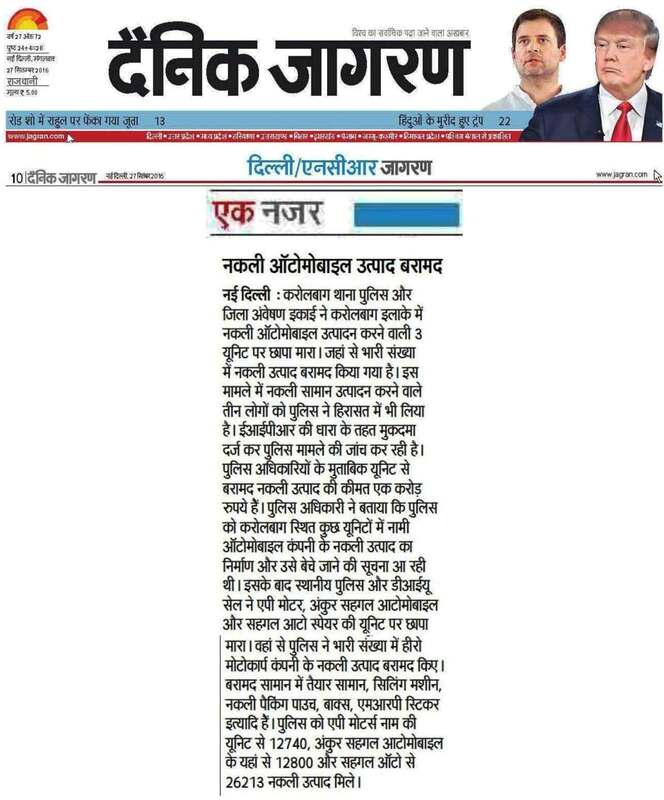 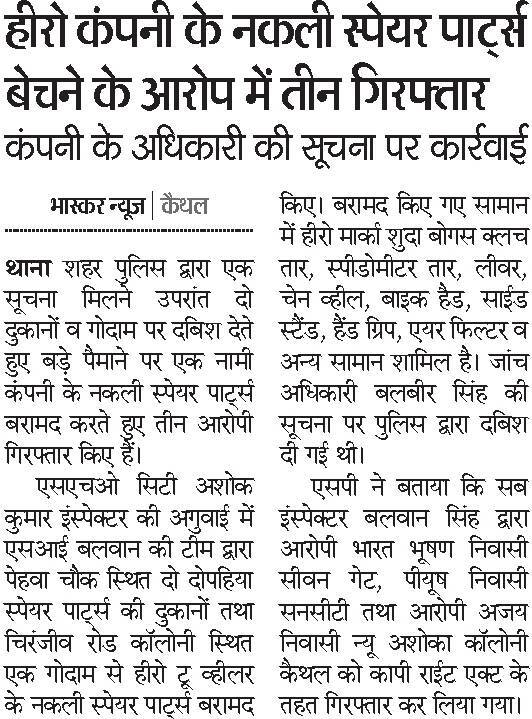 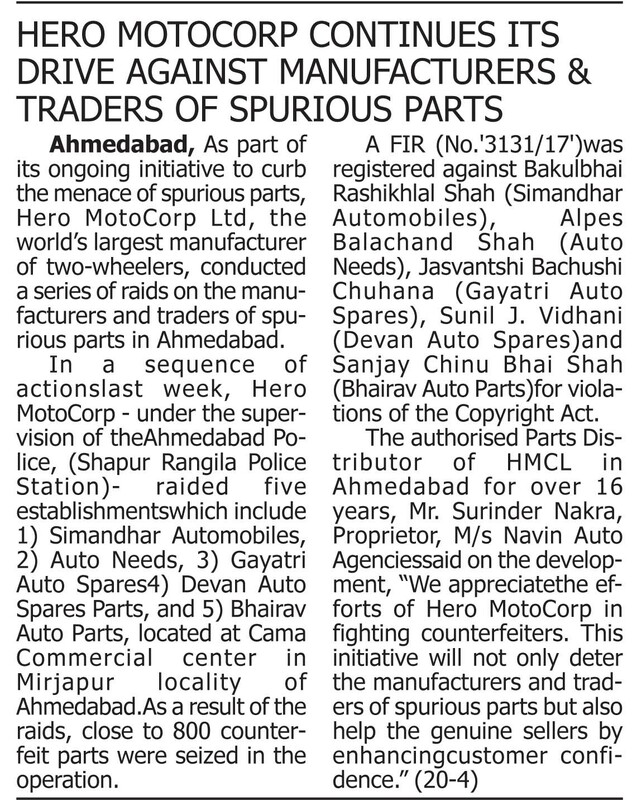 This action is just a beginning to restrain the menace of fake spare parts being sold by misusing Hero brand name and it will continue in different cities across the country with full swing. 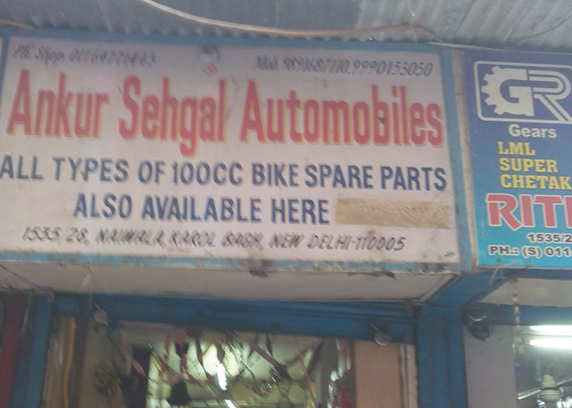 This drive against spurious parts manufacturers ensures the safety of the vehicle and those riding it, and will play a huge role in curbing environmental pollution. 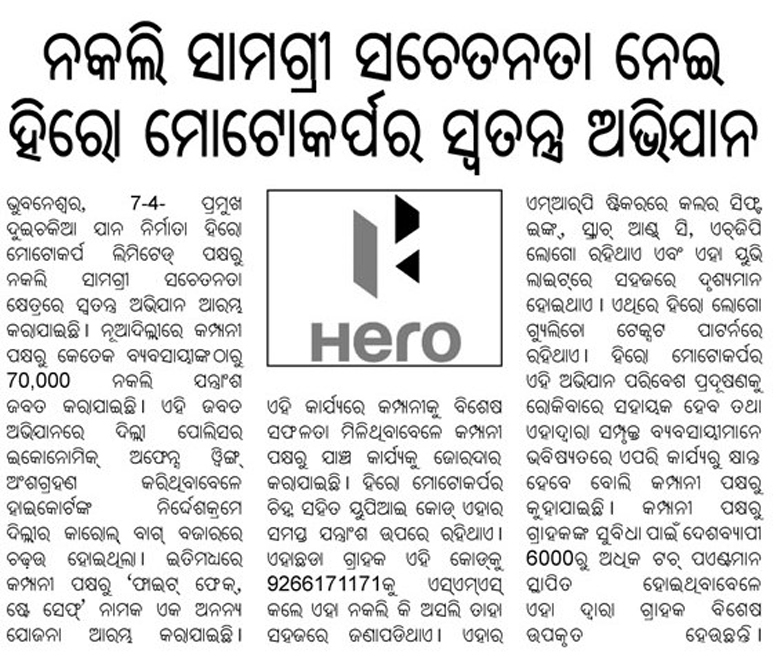 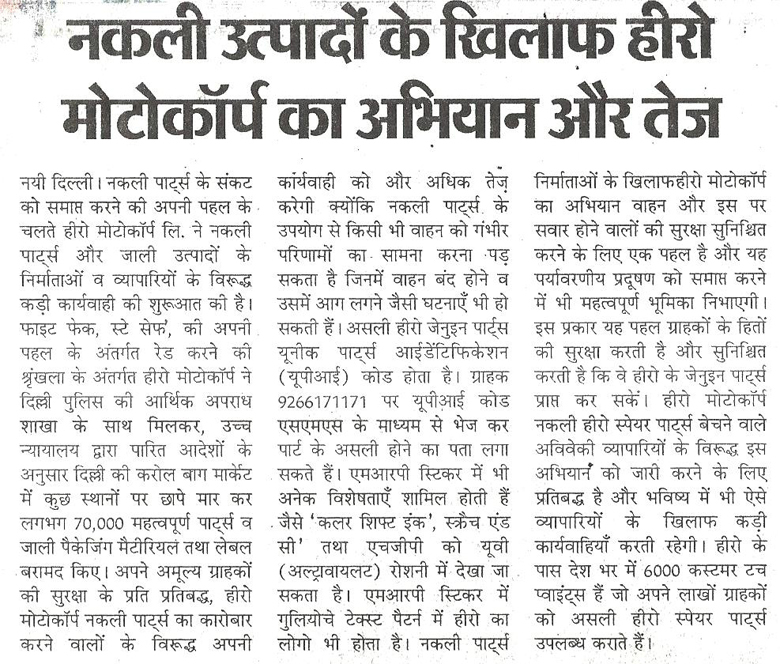 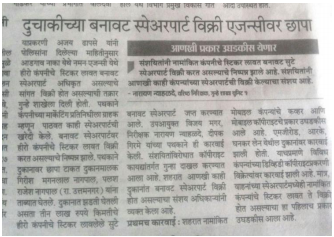 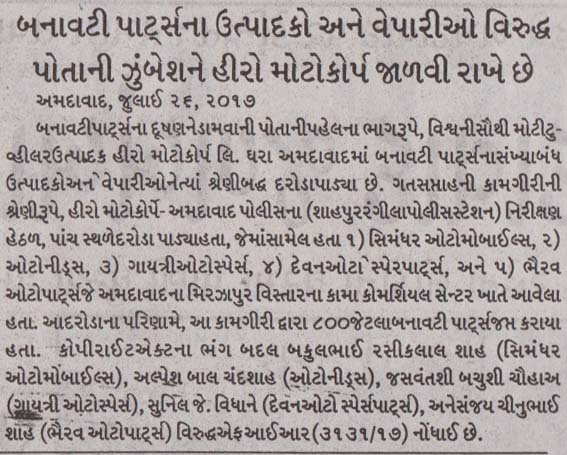 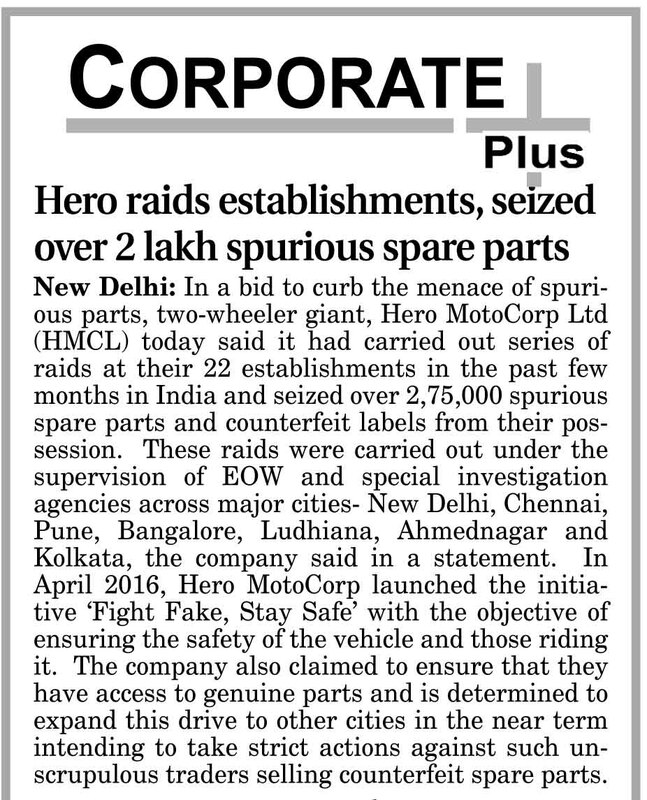 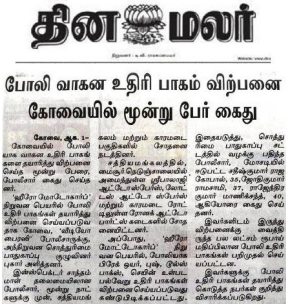 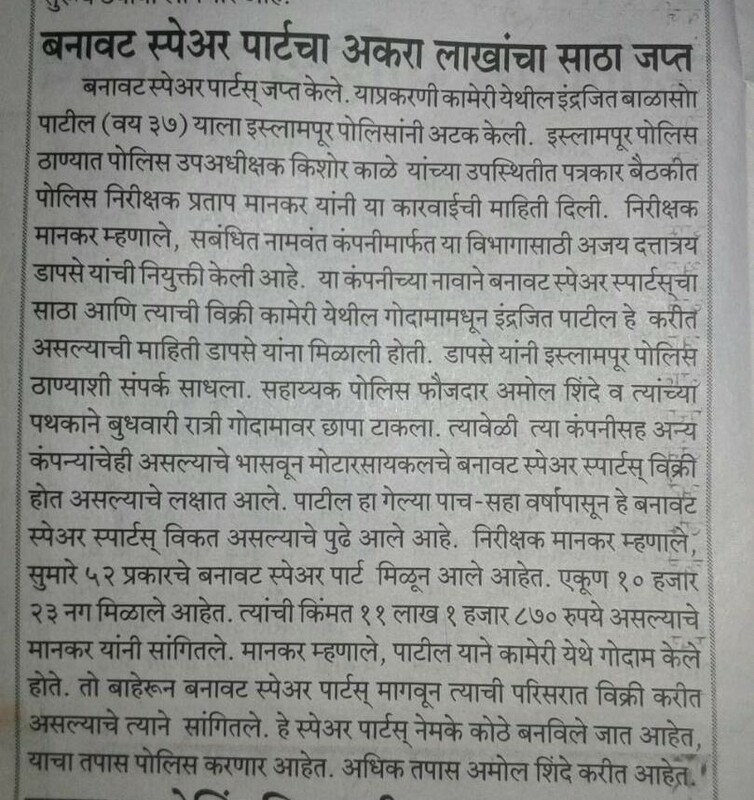 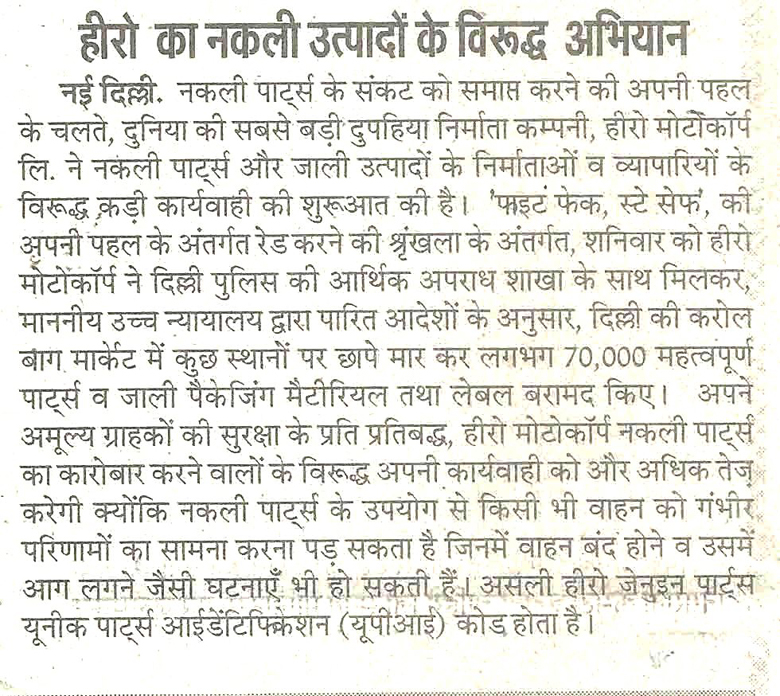 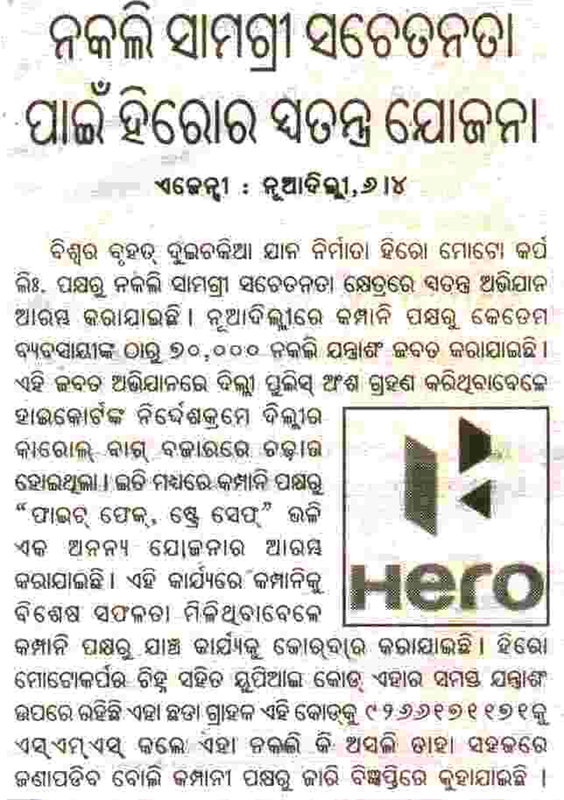 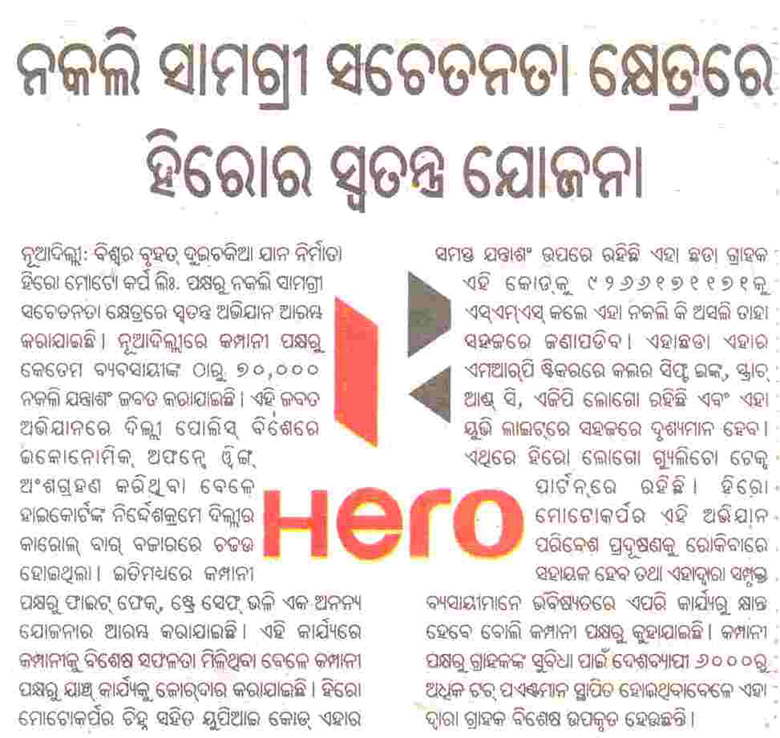 Hero MotoCorp is committed to continue this drive against unscrupulous traders selling counterfeit Hero spare parts and intends to take strict deterrent actions against such traders in future also. 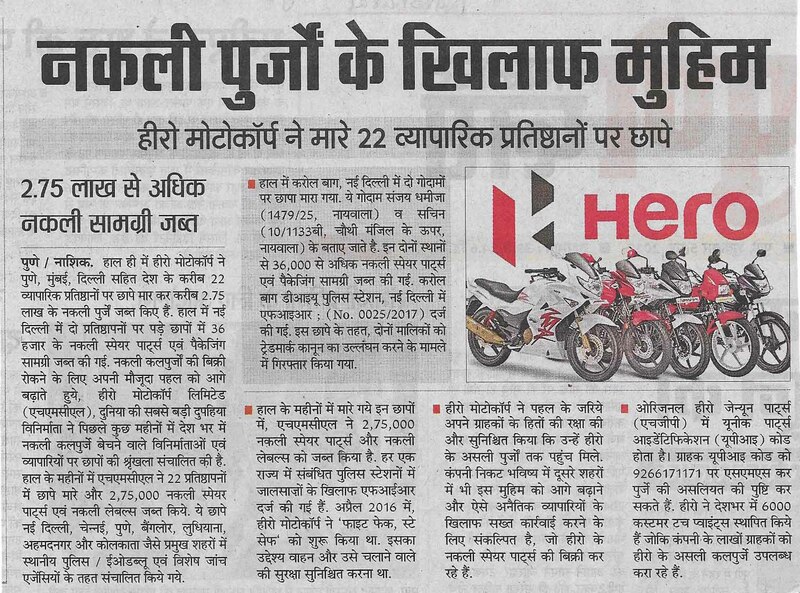 Original Hero Genuine Parts (HGP) bear the Unique Parts Identification (UPI) code. 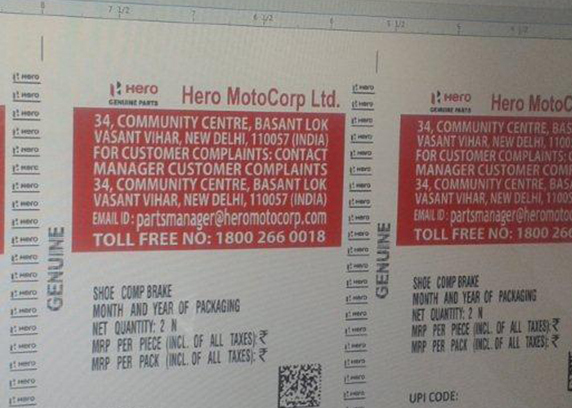 Customers can confirm the genuineness of the part by sending UPI code through SMS on 9266171171. 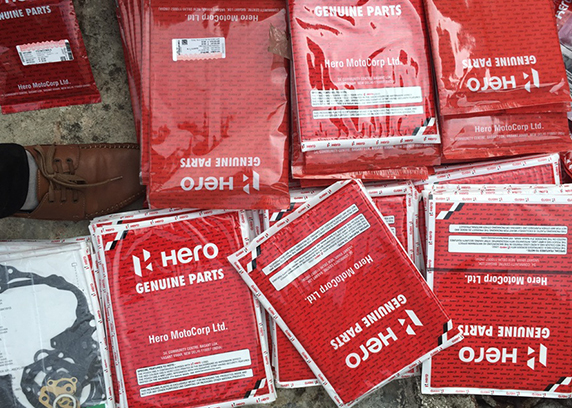 Hero has over 6000 customer touch points across the country, making Hero Genuine Parts available to millions of its customers.